Something I’m often asked by people who have knee pain is if there is any supplement, food, pill, etc. they can take to alleviate their pain. One of the supplements most often referenced for knee pain / arthritis is glucosamine and chondroitin. So does G & C actually do anything to help relieve arthritis and or pain in the knees? Hopefully through the following studies I’ll be able to shed some light as to whether this supplement is worthwhile. It’s rare I see glucosamine and chondroitin sold separately, although it is easy to find if you really want to. And it is rare I hear people taking one or the other and not the combination. Because of that, and to make things simpler, I’m only going to look at the results of the following studies regarding taking the combination. Also, rather than do a full review of each study, I’m just going to steal some of the most pertinent quotes and data from each and chime in when I see fit. It’s important to note in this study it was found when patients in mild pain were compared to moderate-to-severe pain patients, moderate-to-severe patients had much better outcomes with the use of supplementation. 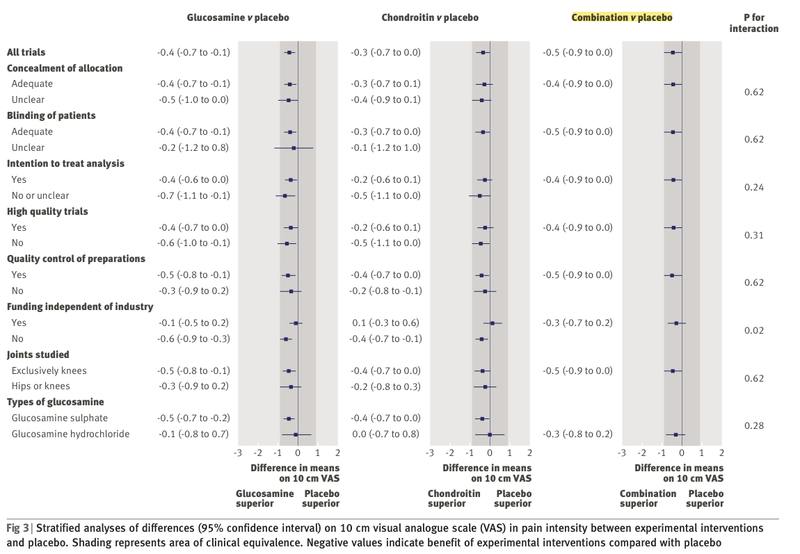 Also, while the mild pain group did not have a statistically significant difference between placebo and supplementation, there was still a difference favoring supplementation (this is a theme in these studies). You can see supplementation was better than placebo in every category. Often times it was barely better, and maybe not clinically relevant, but it was still better. 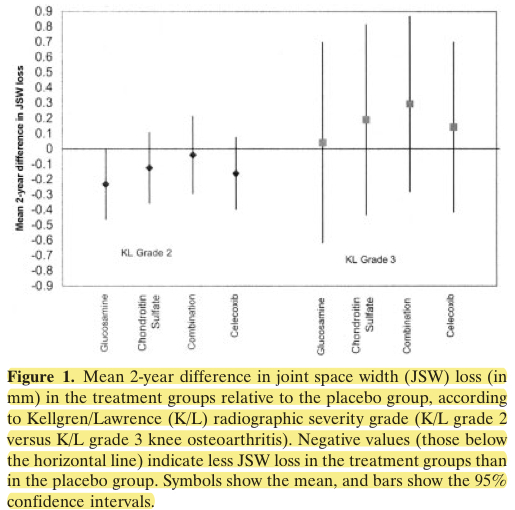 The two most common ways these studies seem to assess the efficacy of glucosamine and chondroitin is pain reduction (such as the study above) and joint space width. In many individuals with knee pain / arthritis there is a reduction in the space between the knee. Supplementation is considered to be beneficial if it helps prevent this reduction. Therefore, it appears supplementation may only be beneficial for groups who have attained a certain level of arthritis. And for other groups who have already reached a certain point supplementation may actually be harmful and accelerate their arthritis. “no statiscally significant differences nor clinically relevant differences were found.” However, when given separately supplementation still consistently outperformed placebo. Combination therapy performed the same though. 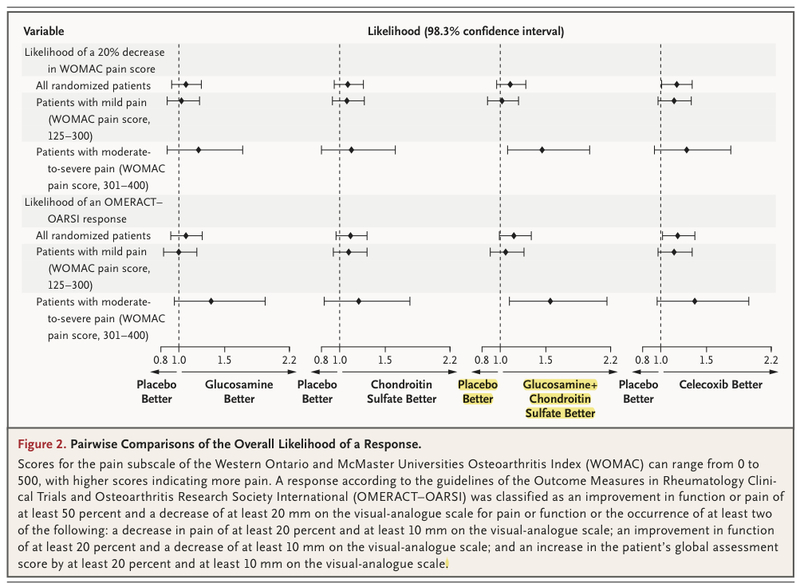 Ok, so the overriding theme in these studies, I think, is glucosamine / chondroitin supplementation is consistently found to have a small, possibly but often not statistically significant effect. One which is nearly always better than what is found in the placebo group. In other words, it helps with knee pain but multiple studies claim it is not statistically significant nor clinically relevant. Based on the fact supplementation pretty much always bests the placebo group and the amount of people who have told me the relief they have gotten from the supplement, maybe the studies need to redefine what is clinically relevant? I really don’t know if they do or not, but there is little doubt the supplement is doing something. Perhaps some are responders for one reason and others are not. The first study showed those with mild arthritis knee pain only got a little relief. The second study showed those with pretty severe arthritis didn’t get any relief. Leaving those in the middle of the two to get the biggest relief. Perhaps more studies need to be done dealing with this middle group? I obviously don’t know for sure, and the thing I found at the end of tons of papers on this subject is a conclusion to the effect of, “We need more studies” illustrating a lot of people aren’t sure. What a, gasp!,, logical approach to healthcare: There is some effect noted and people report a benefit from the supplement, however it is at this time not considered clinically relevant. Therefore it is hard to justify an insurance company paying for it. If you don’t mind paying for the supplement yourself, there isn’t any reason not to do so. I’ll add GC supplementation seems to be worthwhile for those looking to alleviate some of their knee pain. Unless you have severe arthritis there doesn’t seem to be much reason to not take it. It’s not very expensive, and it is definitely doing some beneficial things. Just don’t rely on it as your only, nor primary, pain reliever. ← Was Chris Paul’s hamstring injury avoidable? Thank you for the input. I’m hoping to read your links by the weekend.